The guide to all things faerie in the Castle Falkenstein setting. I little while back I went back to a game store in Chicago I literally hadn’t been to in twenty years, Games Plus in Mt. Prospect. When I’d last been there I remember picking up 2nd edition Ars Magica. But more importantly, even though we had a solid local game store, it was the first place I ever saw an R. Talsorian product- the original Cyberpunk 2013 boxed set. 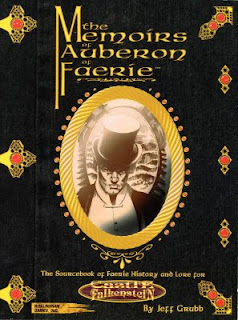 In a strange link-up, on my recent visit I finally found a copy of The Memoirs of Auberon of Faerie- the only Castle Falkenstein product I’d never actually seen in the flesh. Even though I’d managed a game store during the period when CF first came out, we’d never been able to get a copy on the shelf- or at least I’d never seen it. And I’d always managed to miss it at conventions. So- with the wait and the hype of people telling me it was their favorite CF supplement- is it wonderful? 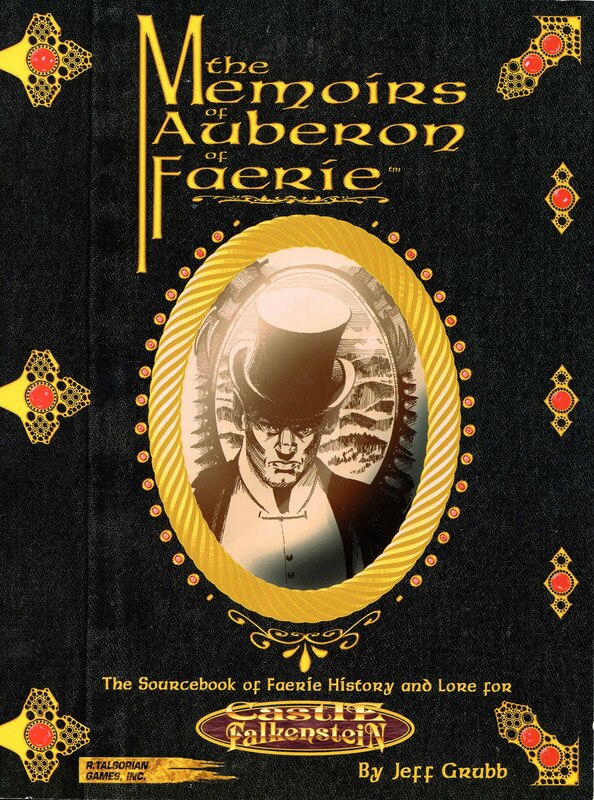 The Memoirs of Auberon of Faerie describes itself as "The Sourcebook of Faerie History and Lore for Castle Falkenstein." It’s a 128 page softcover, with a black and white interior. This book opts to use straight black ink as opposed to some of the other CF sourcebooks. It follows the same layout standards as the rest of the line. That means it is generally solid and clean, but does have some strange shifts to smaller and denser fonts for sub-sections- some of which get hard to read. That’s particularly true for tables and reference pages. Still for something from the mid-1990’s it does a nice job with the techniques available. The cover’s pretty terrible- a weirdly faux-looking bookcover and a cut and paste image. The book itself has a ton of interior art, with plenty of specific illustrations for the various kinds of faerie. However Lawrence Allen Williams provides most of that art. I’m not fond of his style- in places it looks OK, but a good deal of it doesn’t work at all for me. Ironically he’s at his best when he’s drawing the unearthly, as his problematic grasp of faces, form and anatomy don’t show as strongly. Now that’s a personal preference, it you’re a fan of LAW’s work, then you’ll likely be pleased by the consistent presentation. In a change from the rest of the Castle Falkenstein line, Jeff Grubb drops in to write this book (as opposed to Pondsmith and company). Grubb’s a veteran and prolific game designer, with a long and strong track record at TSR. He follows the pattern of other books (like the core book, Six-Guns & Sorcery, and The Book of Sigils) in establishing a narrative frame, a story running through the book. In this case, the book is literally what it says it is, the memoirs of the character Auberon from CF. But Grubb uses the PoV of the biographer asked to take down these words, a nice device that has a decent pay off at the end of the book. Grubb manages to echo the tone and voice of the other books- but at times he hits a few false notes. Some of that works because the narrative does revolve around truly strange creatures, but in several places I found myself thrown out of the story. In the Castle Falkenstein nineteenth-century Steampunk setting, Auberon leads the Seelie, the "good" faeries. He’s opposed by the Unseelie, led by the Adversary. Faeries fit centrally into New Europa, but can be given more or less attention depending on the GM. The core book offers basics on playing such characters- including one type where you essentially have to hide from the party the whole time. This book works to expand the background of the fey as a whole, give them greater context in the setting, and providing richer choices for those who wish to play one. The first thirty-eight pages offers a lengthy narrative history of the faeries. Essentially they existed as creatures of pure energy and will, until they fell through the Veil into a real world. There they assumed physical form- based on imitation and adaptation. The various species, powers and restrictions of the types of fey arose from that process. And then the faeries literally destroyed that world. There's more than a little echo of Steven Brust's To Reign in Hell throughout. Grubb does a good job of describing the "otherness" of the faerie: how their lack of inherent imagination forces them to ape the manners of humanity. They lack experience with the world and have no moral or social obligations limiting them, and so they eventually destroy everything in their path. There’s a strange tension throughout this early narrative- with Auberon serving as a kind of faerie apologist. But make no mistake, he’s as monstrous as the others. Eventually he changes and evolves, but your reaction to the story here will depend on your reaction to that character. Some may find his later sufferings and trials make him sympathetic. I don’t so much; I don’t hate him, but I don’t think I end up in the place the author wants the reader to be. Instead I'm pretty much thinking about how to destroy the fey, "good" and "bad." Still the narrative is compelling in this early section, detailing how the fey moved from world to world- facing some obstacles they couldn’t overcome, with the greatest of them being killed, why they have a European flavor to them, how the division between the Courts arose. Finally it describes their arrival and machinations in the world of New Europa, the Fifth Earth. It works as a story pretty decently. The Fourth Earth the Fey come to is a far-future sci-fi universe which looks a lot like Warhammer 40K. I hit that part and just went "ugh." It might sound silly, especially when we’re dealing with a game which is a mash up, but the genre collision here felt unnecessary and over the top. Castle Falkenstein puts together magic, steam tech, and the fey in a single setting. To have the existence of power-weapons, battle-suits and the like is over-egging the pudding. That world isn’t connected to the CF universe, but it is mentioned and out there- an unnecessary detour. Eventually I forgot about it- but it does get pop up again in the book (hidden super weapons, etc) and each time I got irritated anew. In addition to the history presented here, the book stops off to provide some substantive background and rules information. There’s a breakdown of the worlds of the Faerie Veil, as well as how that interacts with the modern Falkenstein setting. Four pages are given over to describing the faerie abilities, with special emphasis on how those fit into combat. There are discussions of promises, repulsions, the Courts, and faerie death- all useful for any kind of fey game. Finally there’s also an explanation of how the Dwarves arose in the CF world, split off as they are from the fey. With that story finished, the bulk of the book presents an extensive breakdown and discussion of the various types of fairies. This runs from page 39 to pretty much the end of the book. It begins with what it means to play a faerie and some suggestions about which kinds make better dramatic characters than others. It looks at how the powers of the faerie make them "alien"- giving them a different viewpoint on the world and interactions with it. Over nineteen sections we get a pretty amazing look at the variety of faerie-kind, from Brownies to Fetches, Giants to Lake Ladies, Phooka to Selkies, Pixies to Vampires. Each section offers an overview of the type plus discussions of the many different "sub-species." So for example in the first section on Brownies you get Hobs, Bwcas, Fennoderee, Grogans, Piskies, Trow, Killimoulis, Gnomes, Gremlins, and Mannikens. Each gets several paragraphs describing what they’re like, usually with an illustrative anecdote or story. You get pictures for most of the types as well. Each section ends with a presentation of the stats for the types, and some small additional rules. All of these are fun reads- with great stories, often suggesting plots, NPCs and incidents for the game. Most of the material here is system-free. You only really get mechanics on each section's final page. Some of the material does tie into the particulars of the Castle Falkenstein setting, but overall this would be a significant and useful resource for any GM interested in a classic and western approach to the fey in a campaign. I think this could easily be borrowed for any kind of Victorian setting, or even a modern one. I can imagine a Faerie Hunters campaign using Gumshoe, for example. The book ends with special kinds of faeries, in particular the Daoine Sidhe, who are cross-breeds with significant power. While there’s some general material which could be used elsewhere- the characters presented (including Dracula) are particular to the CF setting. Five pages cover The Adversary, The Wild Hunt and Auberon himself- powerful NPCs and ideas which could reshape a campaign. Finally some of the unique weapons of the faerie appear, plus stats and background for Auberon’s powerful and significant children. The last two pages of the book pull of a neat trick of tying into the opening framing sequence- and providing pay off for clues dropped throughout the book. While these last sixteen pages are good, they offer the most to GMs looking for CF material. I’m perhaps spoiled a little by my exposure to the two breeds of faerie books in Changeling the Dreaming and Changeling the Lost. The former presents the faeries as creatures who create imagination and the latter presents a darker take on the fey. Memoirs came out two years after CtD, and presented a much more structured and classic take on the topic. I like the Memoirs book, but I don’t love it. There are several missteps- the way Auberon’s presented, the goofy sci-fi bits, and the artwork- that throw me out. But there’s a lot of good stuff here. I think the question is how much the faerie interest you if you are a Castle Falkenstein player or GM. Either could benefit from this book greatly. How useful is this for non-Castle Falkenstein gamers? That’s a mixed bag. The first section would be of less interest, except for some of the ideas on how faerie powers operate and interact with the world. But I think the larger second section could provide a really useful framework and resource for any GM wanting to bring those ideas into a campaign. In that regard, it stands up as one of the best, stat-light resources on the topic. Sounds like an interesting supplement. I've never played Falkenstein, but the taxonomies in particular sound cool. Not my favorite CF supplement. I was especially turned off by the art.